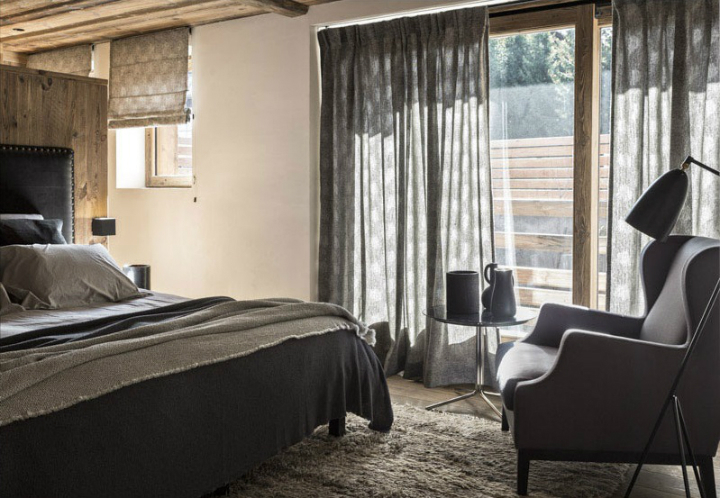 All chalets are amazing, but are you looking to take your interior design to the next level? 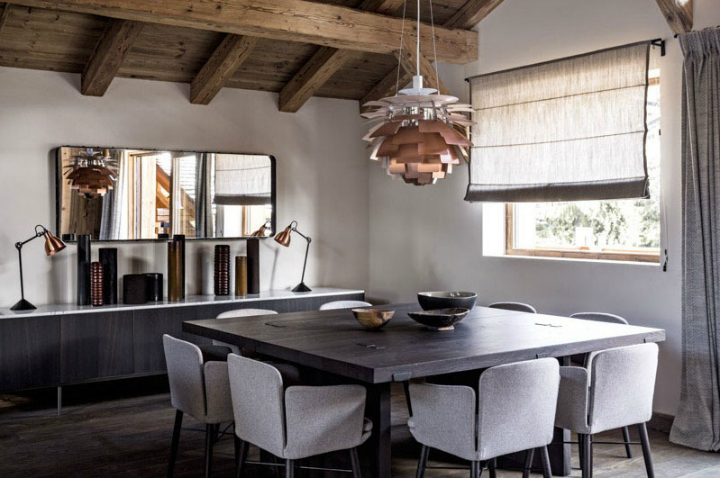 Whether you have help or are doing it on your own, consider this gorgeous chalet in Mégève, France designed by Maison Hand, as your interior design inspiration. Calm gray, black, and white contrast with rustic earthy materials and brass and copper design lighting features add warmth and a sense of completion to this sophisticated interior design concept. 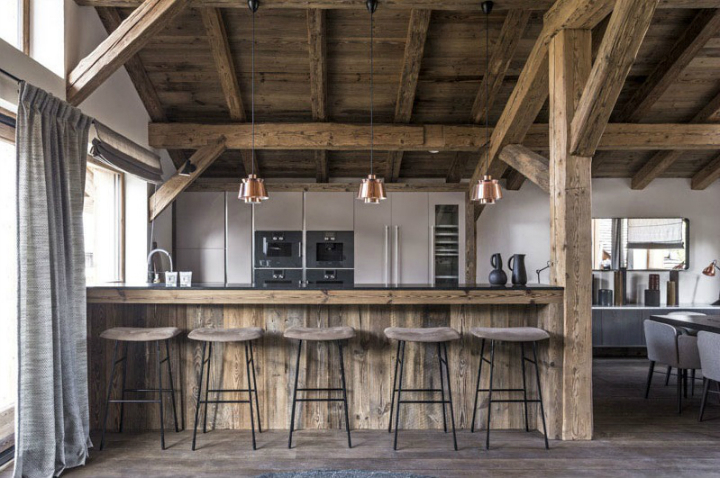 The high ceilings with rustic wood beams set the tone right off the bat, but this chalet truly shows what going the extra mile with earthy materials and textures can do. Wooden plank facades outline the television and fireplace and the bar across the way is planked to match. Natural materials extend to the floorboards as well, which are simultaneously darker than the other planks but almost gray on the surface. 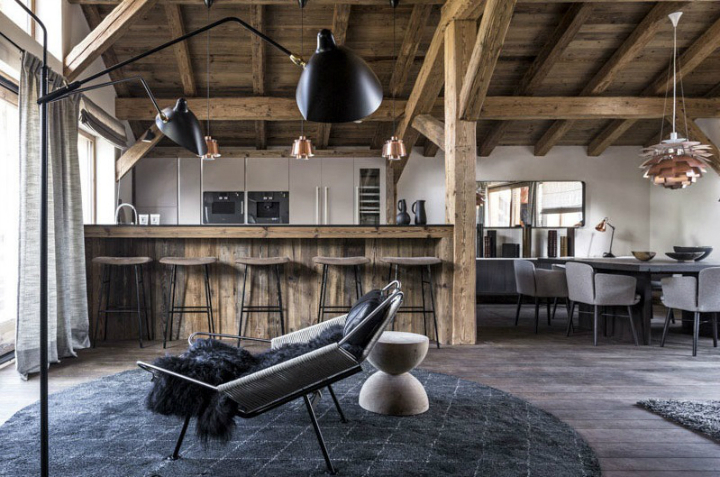 The floor unifies the color theme of the entire chalet, bringing the monochrome gray and black of the interior into harmony with the rustic planking. Smooth black tables contrast with soft gray couches and chairs in the lounge room. Glass bottles provide a bit of personality on these clean tables that are perfect for resting a magazine or drink. A black throw blanket on the sofa ties everything in the area together. In the living area, a fluffy black chair with metal accents rests on a rounded black rug. Black floor lamps and a small gray hourglass-shaped accent round out this serene but modern room where you can gaze out windows at a beautiful view or pull back the woven gray curtains for a quiet night in with the fire. Back to the bar, where four taupe-seated bar stools with black metal legs make the perfect place to sit and compliment the wooden facade of the bar. Two black pitchers and warm brass lamps serve as decor accents, while a silver and black oven matches the chrome sink faucet. White walls balance out a bevy of materials and colors, bringing it all into balance. The dining room finds its center with a gorgeous copper Louis Poulsen PH Arichoke pendant over the dining room table. 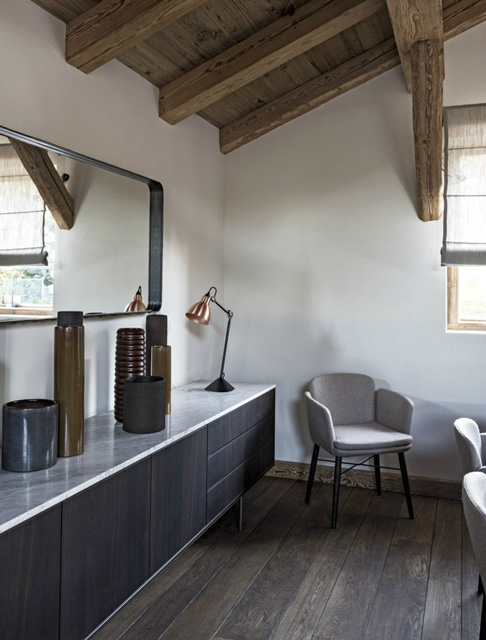 Brass and black bowls and side copper lamps adorn the smooth black wooden surfaces, while a long rectangular mirror creates the illusion of more space. Light gray curtains, shades, and chairs soften up the strong elements for a stunning dining room display! A more modern bedroom with light rustic touches are a calming force here. Taupe, gray, and authentic black rule here. 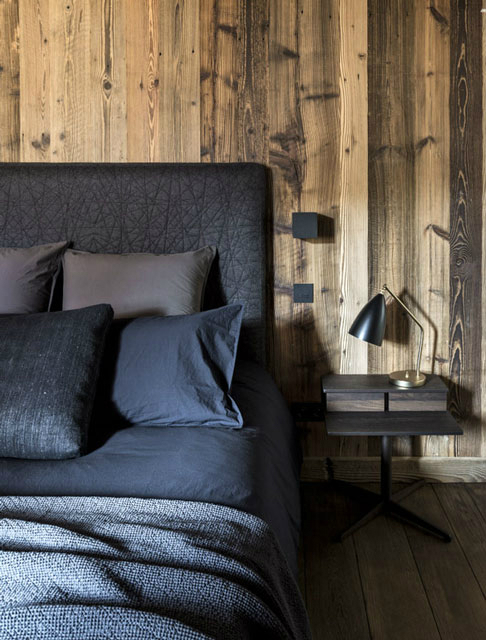 A wooden headboard is offset with a black leather version, but the rest of the room centers in taupe shades and shaggy rug and gray chairs, bed accents, and curtains. 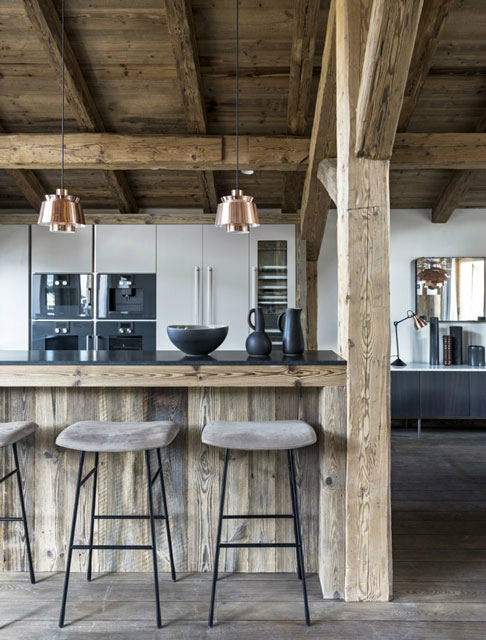 Black or copper lamps add a bit of sophistication to an already clean, modern look that employs a bit of the rustic. 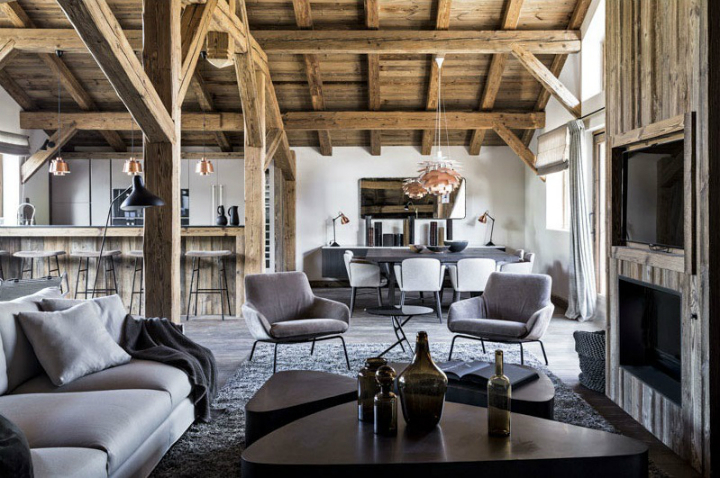 Thinking about using this chalet as inspiration for your home? 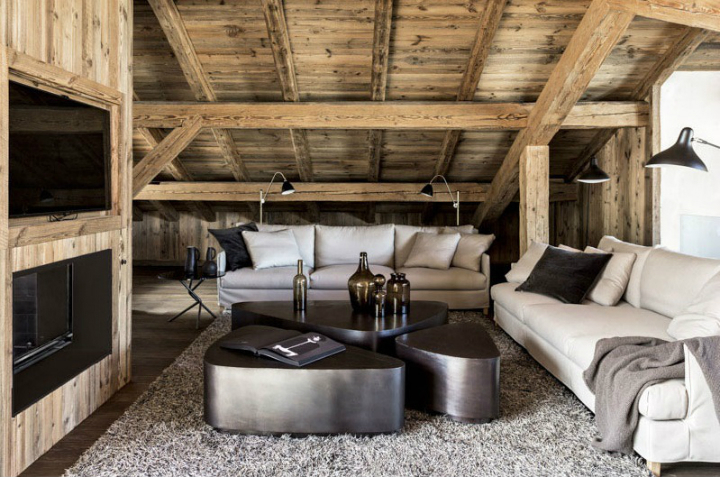 The gray, black, and taupe mixed in with wood and metal in this chalet are what make it really shine. Aesthetically, nothing is overwhelming it all fits together like a gorgeous interior design puzzle. You can change the colors or take what’s here and make it your own for what is sure to be a stunning final result.